are #1 in usage of social networks! The webinar version is available by clicking here. Neilsen reports that Australians spend 7 hours 17 minutes per person each month on social networks and blogs. Australian social media usages was highest for the second year running, out of Nielsen’s Internet-metered markets including: Brazil, France, Germany, Italy, Japan, Spain, Switzerland, U.K., and U.S. This means Australians used social media 25 minutes more per month than the previous year. That’s quite a bit more. A lot of it is due to not knowing and confusion. For example, there’s a common misconception that links last a lot longer on Facebook than Twitter, because the newsfeed moves slower than the stream, but recent research confirmed this is not the case. The concept of the half life of a link is important if you’re in the news business, but if you’re a business looking to stay in business for years to come, what is important and relevant to you is the value of the individual links established, not the half life. Why is a blog important for your sales lead generation? Do you remember the days when you could list your business in the Yellow Pages and then wait for the phone to ring? Those days are long gone. The Internet has changed business forever. That’s a good and bad thing. It’s good because the most effective strategies are FREE, but the bad thing about is unless you learn what works versus what doesn’t, no new prospects call or walk in the door. If you’re struggling to get new clients – have you considered why that is? With still only a minority of small businesses embracing social networking strategies (that actually work), it’s the equivalent of them being listed in the Yellow Pages with a HUGE AD and you not being listed at all. It gets better (or worse depending on where you are) – many small businesses are wasting a lot of time, money and effort on social networking tactics that just don’t work. That means they are spinning their wheels, not getting anywhere. They are paying so-called social media experts to do things for them so they can tick the box, but more often than not, are left with an invoice and no new business. There is a small percentage of business entrepreneurs who know what to do (most of it is FREE) and are generating new leads every day. Many have abandoned Google Adwords because they are just too expensive, plus WHY PAY for traffic that you can get for FREE? Let’s face it. If you’re not blogging, you’re just not serious about sales lead generation. If you’ve struggled to get online and are a little overwhelmed by the Internet’s technical jargon, look no further – this one half day event is specifically designed for you. I will take you through the basics of blogging step-by-step, click-by-click, on screen, live and interactively. I will explain what you need to do, why you need to do it and how you can do it. If you know how to type and “cut and paste”, you can be a blogger. Best of all – everything I am going to show you is 100% FREE and accessible on the Internet via your browser. This workshop will enable you to generate new sales leads for FREE – best of all, your competitors won’t have a clue, so they won’t be able to counteract what you’re doing! 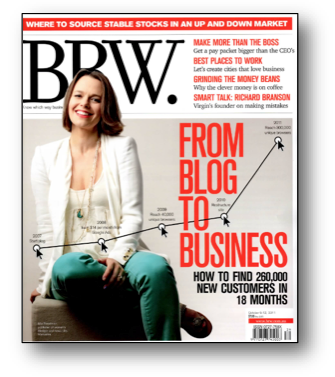 Do you grasp the importance of this BRW Magazine cover story? with very little competition for new sales leads. The moral of the story is that for online search, getting ahead and staying there is a race that some businesses are winning easily and inexpensively – BECAUSE so few of their competitors are doing it. Within the first hour of the workshop, you’ll recognise that any time advantage you can get NOW will pay off instantly and you’ll be set for the long term.